Cinematical reports that Ann Brashares new book, My Name Is Memory, has created a bidding war between studios. This new book isn’t due out until June 2010, but the rights have been purchased already by New Regency. Featuring a college-age couple, I am wondering who the audience is for this new series. But I’m guessing Twilight fans will enjoy this story of reincarnated souls. UPDATE: Thanks to /Film for pointing me to an excerpt from the new book on Brashares’ official site. 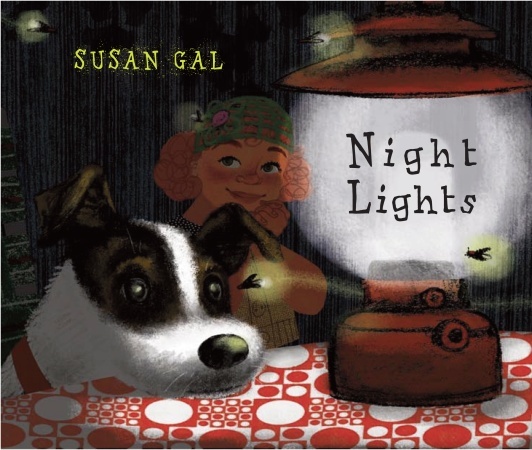 Follow a girl through her evening in this quiet picture book. The book begins with her biking home with her mother, roasting hotdogs with her dog looking eagerly on, celebrating the dog’s birthday with a huge dog-bone cake, and then her bedtime routine. Each page has only a few words and those explain the various lights that illuminate the evening. The story itself is told entirely in the illustrations. It is those illustrations that make this such a marvelous picture book. Each page has a glow about it without using any glitter or extra glued on sparkles. The light comes from inside the illustrations, done in charcoal on paper and digital collage. The collage effect is subtle here, captured mostly in the fabrics in the pictures. The illustrations are warm, friendly and cozy, perfect for bedtime. With its small word count and inviting illustrations, this debut picture book makes a perfect bedtime book for a toddler. Appropriate for ages 1-4.